Figure 1. The mention of a tornado conjures up images of raw destructive power. Tornadoes blow houses away as if they were made of paper and have been known to pierce tree trunks with pieces of straw. They descend from clouds in funnel-like shapes that spin violently, particularly at the bottom where they are most narrow, producing winds as high as 500 km/h. (credit: Daphne Zaras, U.S. National Oceanic and Atmospheric Administration). Why do tornadoes spin at all? And why do tornados spin so rapidly? The answer is that air masses that produce tornadoes are themselves rotating, and when the radii of the air masses decrease, their rate of rotation increases. 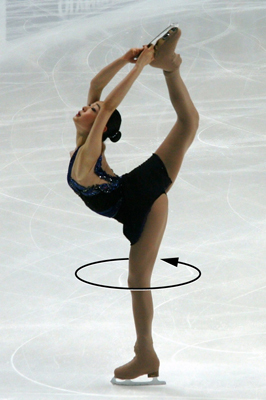 An ice skater increases her spin in an exactly analogous manner as seen in Figure 2. The skater starts her rotation with outstretched limbs and increases her spin by pulling them in toward her body. The same physics describes the exhilarating spin of a skater and the wrenching force of a tornado. Clearly, force, energy, and power are associated with rotational motion. These and other aspects of rotational motion are covered in this chapter. We shall see that all important aspects of rotational motion either have already been defined for linear motion or have exact analogs in linear motion. First, we look at angular acceleration—the rotational analog of linear acceleration. 10.0 Introduction by OpenStax is licensed under a Creative Commons Attribution 4.0 International License, except where otherwise noted.